Nepali police use tear gas to disperse crowds of the Tarun Dal, the youth wing of Nepali Congress Party, during a demonstration against the government in Kathmandu on July 21, 2018. Dozens of protesters in Nepal have been injured in clashes with police at a demonstration in support of a hunger-striking doctor seeking better health care in the impoverished Himalayan country. 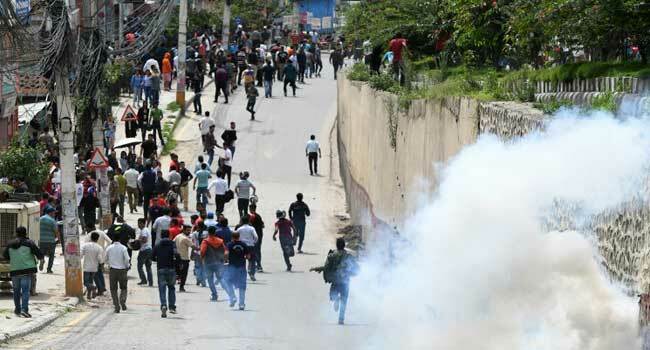 Protestors from Nepal Tarun Dal, the youth wing of the opposition party Nepali Congress, were injured when police fired multiple rounds of tear gas and used batons as they entered a restricted area near the parliament in capital Kathmandu. “We are protesting against the government’s authoritarian-like behaviour. They are not listening to the people and to the just demands of Dr Govinda KC,” Bhupendra Jung Shahi, general secretary of Nepal Tarun Dal, told AFP. Viewed by his supporters as a medical Robin Hood, Dr KC is well known in Nepal for his philanthropic work, travelling to some of the country’s most remote communities to provide medical care and train local health workers. A key sticking point has been a medical education bill registered in the parliament earlier this month seeking to overturn an ordinance by the previous government that met Dr KC’s demands to regulate doctor training and curtail commercialisation in medical education. “Until the government responds to his demands we will continue to protest peacefully and draw the attention of the government,” said Dinesh Prasai, a professor who had joined the fast.